This stunning and successful daughter of AA Apollo Bey has joined the Maplewood broodmare band. We were so impressed with the *Maddox Van Ryad colt, Maximus, produced by her full sister, Shreddin Betty, that we jumped at the opportunity to bring Lah Lah+/ to *Maddox. 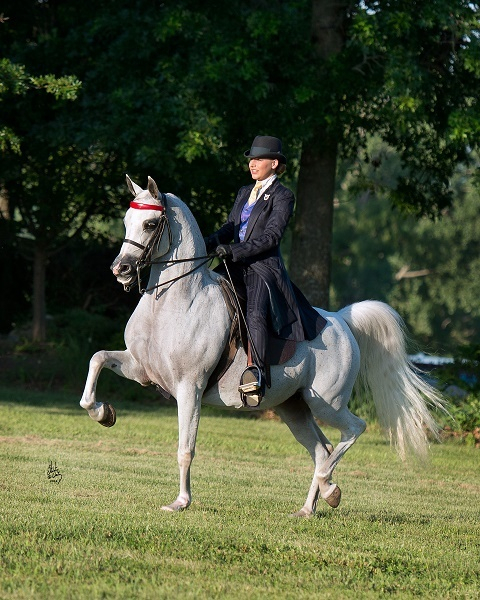 Lah Lah+/ was US Reserve Champion English Pleasure Junior Horse, Youth National Champion English Pleasure JTR 13& Under, Canadian National Champion English Pleasure Junior Horse, and Reserve Canadian National Champion Park AOTR. She has multiple Top Tens at Canadian, US, and Youth nationals, and numerous championships in Regions 7, 8, 11, and 14. This entry was posted in Mares on January 18, 2017 by Anita Enander.